Spring ends are a defining characteristic of springs. Knowing which spring to use for a particular need or job requirement will depend on the spring ends. Some spring ends are hooked or looped, others are closed, and others are open or straight. However, of the many varieties of springs, the market is primarily composed of three kinds. These are compression, torsion, and tension or extension springs. Each of these springs has different ends for different applications. Compression springs, also known as the coil spring, are made of steel spring wire and come in a variety of shapes and forms. Compression springs resist forces or store mechanical energy when compressed or in the push mode. Used in automotive, aerospace, manufacturing, medical and technology industries, the force produced by compression springs makes them an excellent component for storing energy. Compression springs are used in everyday items, such as pens, vehicles, shafts, and mobile phones. Compression springs have two basic end type options, either closed or open. The more familiar is the closed end type of spring. The spaces between the last two coils on a closed-ended spring are squared off and touch each other so the ends sit flat. The ends of open-ended compression springs are not squared off. In order to stay upright, they are placed over rods or shafts. Torsion springs are those springs that supply force when you torque them or twist them. Cylindrical by design, the spring wire can be made from square, flat or rectangular steel spring wire and can be any shape or size. The load of torsion springs should always be set so that the spring is closing. The ends of torsion springs, called legs, are straight and set at varying angles (90°, 180°, 270° or 360°) while in a free position. 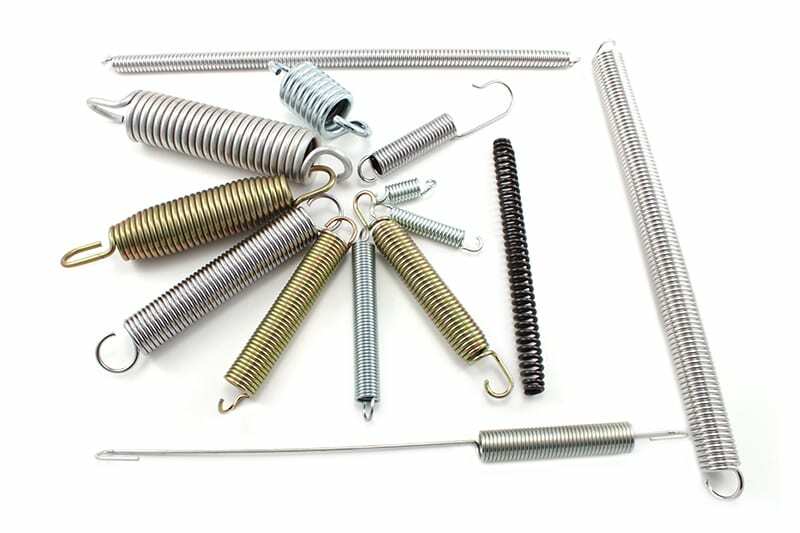 Torsion springs come in a variety of sizes for use in many different applications, from clothespins, screen doors, mouse traps to garage doors. When selecting torsion springs it is important to know if the use is for a right wound or left wound applications once installed. Tension springs, or extension springs, are those familiar lengths of tightly coiled metal, usually from steel spring wire. Hooks and loops are the primary end type options for extension springs. Loops are fully closed all the way around, whereas hooks have a gap between the body of the spring and the end of the hook. Like all springs, extension springs absorb and store energy. Spring tension is created by resistance when two objects attached to either end of the spring are pulled or extended. The spring force and the stored energy act to pull the two objects back together. 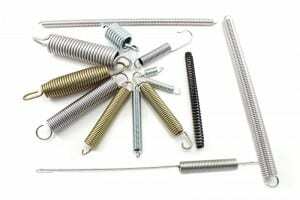 Extension springs are used in farm machinery, automobiles suspensions, garage doors, trampolines and many other applications. Springs are elastic objects that store mechanical energy. They have many designs and everyday uses. Whether compressed or stretched from its resting position, it exerts an opposing force approximately proportional to its change in length. Knowing which spring to use depends on the application. Whether the application will be compressed, stretched or twisted depends on the job requirements of the spring, which in turn, is determined by the spring end. Want to learn more about spring ends? Contact us online at James Spring & Wire for more information!